How my baby has made me a better professional! As women across the world continue to walk the tight rope between motherhood and career, society is finally coming to terms with the fact that working moms are here to stay. Proof lies in the increasing number of companies extending their maternity leave programme and hiring return-to-work moms. Having a baby touches every aspect of a mother’s life and makes it beautiful (let’s forget the dirty nappies for a moment!) Here are just a few ways in which motherhood contributes to making us better professionals too. By the time you’ve had your baby, you most likely have a few years of work experience under your belt or a home/car/bank loan looming large on your mind. Fret not! Having a baby gives you tangible goals and brings perspective to the way you chart you career. You can now chase a visible dream, be it a better pay check, creative fulfilment or a new venture. When you choose to spend time away from your child to invest in your career, you want to make it worth the effort. Ok so even a mom can’t control the clock, but she sure can tame it! If there’s one thing babies teach us, it is that every moment counts and every minute matters. Contrary to the general perception that working moms are always in a mad rush (who isn’t?! 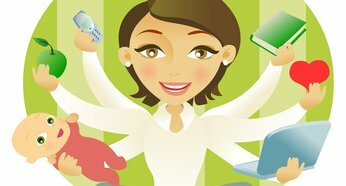 ), motherhood brings with it a rapid shift in priorities, which in turn leads to better management of time and energy, qualities that can take your career to the next level. If you’ve been through labour, there’s little you can’t endure! Motherhood can be as empowering as it is daunting. It gives you an appetite for risk and an increased ability to handle pressure. It also brings with it a stronger sense of self and an openness to new challenges. Crazy deadlines, bad bosses and downward graphs can come and go! 4. Work doesn’t drive you insane, it brings back your sanity! We love our kids all the way to the moon and beyond, no doubt! But when the laundry just keeps piling up and daily tantrums drive you to your wits’ end, funnily enough, Monday mornings don’t seem so blue. Workload takes on a new dimension after having a baby and a worthwhile career can help bring back the calming rhythm that your life was missing! Researchers now say with some scientific conviction that motherhood maximises one’s brainpower, and we cannot disappoint them! Handling the stress of a toddler meltdown, remembering to give them their tonics and choosing the right playgroup for them has a way of sharpening those neurons to work with higher efficiency, both at home and at work. It has very rightly been said that “the hand that rocks the cradle is the hand that rules the world”. Women have the power to shape society for the better through the upbringing they provide its future citizens. Realising this responsibility has driven many women to break the mould and forge more socially productive and gratifying careers. Working mom, techie by day, closet writer!